There is evidence that people who lived in the rainforests of New Guinea had already begun by 30,000 years ago to exert some control over their environment. 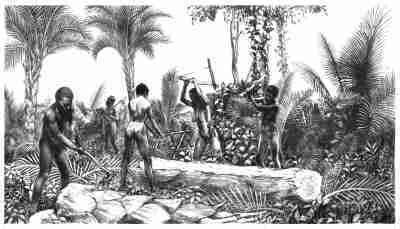 Although still hunter-gatherers, it is thought that they were deliberately encouraging the growth of some wild food plants such as yams and sago, by draining glades and cutting back jungle in those places where they grew naturally. Sago is prepared by stripping the outer layers from the trunk of a felled sago palm and beating the fibrous contents to a pulp before removing it and rinsing it through with water to release a starch rich paste that is then dried to make flour. Large axe heads have been found from this period which it is thought were used to ring bark trees, clear roots and undergrowth and to thin out stands of food plants.